This is quite an ‘in a jiffy’ post. I hadn’t planned it.Actually This week Angie@The Novice Gardener had a pleasant surprise for all the Fiesta Friday wing-ding revelers. Starting this week, we all have a new venue- a private party hall with a fully functioning kitchen. Isn’t that awesome. It means more merry making, cheering,chatting and unrestrained indulgence, in other words more reasons to celebrate. It is not that we had any less fun in the rented party venue all of 59 weeks, but a private hall is something spectacular and remarkable. It means you could make all the noise and let your hair loose while spending the evening surrounded by people whose company you enjoy.In Angie’s words ‘what can be more fun than a bunch of friends getting together and being merry over a table full of food? Congrats Angie and a big thanks for the new party hall and for all the 59 weeks of fun. I have met some amazing friends at your place.This dessert I have made to mark the occasion. This special edition of FF is being co-hosted by two awesome bloggers Nancy@Feasting with friends and Tracy@Scratch it Cook. Nancy is my earliest blogging buddy. We have been feasting together since the inception of this blog. Her blog is full of cheer and the most amazing recipes.She knows that I drool over her Bagels and Red Velvet Sweetheart cupcakes she made especially for her husband ❤ ❤ Isn’t she amazing? 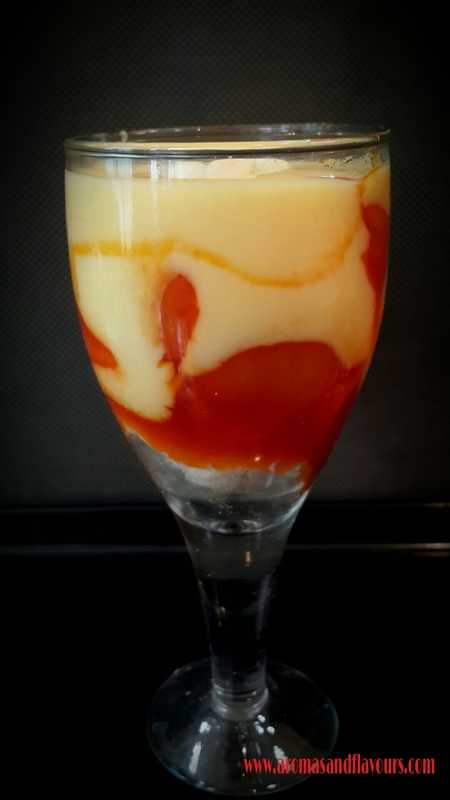 Apricot Pudding is a delicious chilled dessert. Either you can set it in a big dessert bowl or set and serve in individual glasses or dessert bowls . In Hyderabad, this sweet is usually served at weddings. Pour milk in a saucepan and start heating over a medium high heat.Combine the custard power and a very small amount of milk in a small bowl.Mix thoroughly.Add this mixture to boiling milk, stir continuously.Add sugar as the milk starts to thicken. Continue stirring.Remove the mixture from the heat when it reaches the desired consistency(Or as per instructions on the packet). Chill. Cut a roundel from the sponge cake(home made or store bought) so as to fit the bottom of the dessert glass or bowl. Drizzle some fruit syrup/juice or milk on the cake to soak. Ladle in some Apricot sweet. Layer the sweet with custard. Sprinkle apricot nuts on top. Come and join me to this amazing party where fun never stops…. Previous Post Kataifi Chicken or What Ever!!! That pussing looks absolutely delicious!! Gorgeous! Oops!! I mean pudding, haha! Partying a little too hard, are we? Naina? LOL! I meant every word of what I said Nancy. You are my Sunshine friend 🌞 And yes yes for your yummy treats. 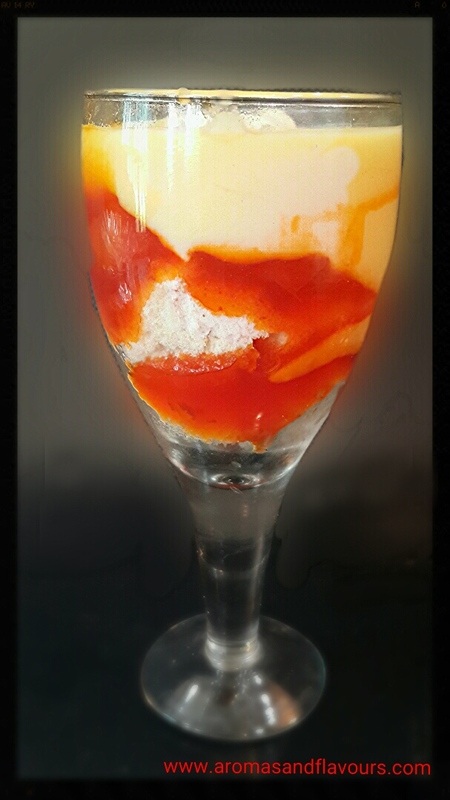 The apricot pudding will be waiting for you . And you always bring sunshine into my life as well, skd! 😀 Thank you for your continued friendship and support! Thank you Linda. It is a modern take on the traditional Khubani ka Meetha. It enjoys a royal status in Hyderabadi weddings. Ooooh that looks so tasty!! Apricots have such a great flavor 😀 Your recipes always look so good skd! Yeah thank you Loretta ☺ It is so simple yet tasty. Wonderful images. I can almost taste the pudding. Have a good time at Fiesta Friday. Thank you so much ☺ It is a very popular dessert with the Hyderabadis. Thanks for the kind words, skd! Your support means so much! And that pudding looks incredibly inviting to me, especially since I’ve been craving fruity desserts lately. Yum!! Thanks for liking the pudding. Thank you dear. I was trying to experiment with my photography which had become quite monotonous and predictable. I’m so glad to get a review on that. Thanks a ton. I agree friends should always find a reason to get together over food. Fun times. Lovely looking dessert. What a gorgeous colored and delicious pudding. My husband loves apricots so I have to make this one for him! Thank you Sandhya. The pudding stays for at least a week in the fridge. I am sure you and your husband will enjoy it. The apricot sweet in itself stays for over a month. Please do try it. Ours will be devoured in no time I am sure! Here it is ⭐ !!!! Hi admin, i see your page needs fresh posts. YOu are truly welcome. I am not that fond of apricots but this looks so nice I am going to try it !